From the drive-through at your favorite fast food restaurant to the aisles at your local grocer, nutritionally empty food choices abound. American consumption of fats has increased 56% since the mid-1970s, and per year sugar intake is an astonishing 15lbs more than 1970*. Making healthy food choices today is difficult to say the least. Even those who strive to make the smartest dietary choices cannot always be certain that the foods they are consuming are providing them with all of their body’s necessary nutrients. 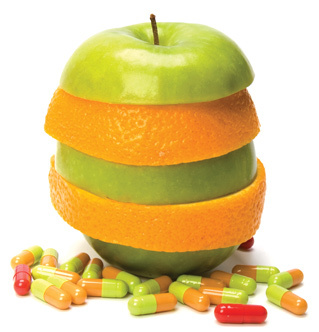 Many have turned to incorporating dietary supplements into their daily wellness routine to help bridge the gap. However, before you think that supplements can help fill all the holes in your diet, think again. “When we think about nutrition in terms of individual nutrients instead of as whole foods we will end up short changing our health and our wallets,” says Jacqui Jarrett, Registered Dietitian and co-owner of Advantage Nutrition & Wellness in Bethlehem. “Supplements should always be used as a last resort as it is always best to get nutrients from whole foods,” Jarrett says. There are several reasons to be careful before reaching for a supplement, including absorption difficulties and lack of regulations. “The latest scientific research is telling us that our bodies do not respond in the same way to individual nutritional supplements (i.e. calcium, vitamin C, omega-3s) as they do when they are in the context of food,” Jarrett says. This can mean that your body is not able to absorb the supplements, effectively making them a waste of your hard earned dollars. Unlike prescription and over-the-counter medications, dietary supplements do not need to be monitored for safety and effectiveness by the Food & Drug Administration (FDA). This can make navigating the supplements market akin to a mine field; however there are some reliable and trustworthy brands, such as Mega Foods, which has chosen to opt in for regulations. Mega Foods is FDA-Registered and GMP (Good Manufacturing Practices) certified. Other brands, including New Chapter, Country Life and Solgar are also committed to clinical research and applications of their products. “These companies are concerned with finding the most effective formulas for supplements,” says Diana Pearson of Queen’s Nutritional Products, a whole food and wellness store based in Allentown. Jarrett recommends brands like Nature Made, that have the U.S. Pharmacopeia (USP) seal, although it is “always best to obtain supplements through a physician or registered dietician,” she says. The best thing to do if you feel that your diet is lacking in nutrition is to seek out the consult of a registered dietician who can work with you to determine your specific nutritional needs. For example, some individuals such as those who have food allergies or intolerances, strict vegans or vegetarians, women who are pregnant, breastfeeding or trying to get pregnant, senior citizens and persons with diseases that inhibit normal nutrient absorption such as chronic diarrhea or celiac disease, may benefit from supplements. As always, “they (supplements) should only be taken under the guidance of a physician and/or registered dietician,” Jarrett says. Additional information can be found at http://ods.od.nih.gov, the Office of Dietary Supplements, a division of the National Institutes for Health. Here you can access downloadable supplement fact sheets, frequently asked questions, consumer protection standards from the FDA and nutrient recommendations.